The Bushwick art scene is still squirreled away in warehouse-turned-studios and lofts above the streets of this industrial neighborhood. Not yet stylish and pricey like Williamsburg, Bushwick still supports a developing young community of artists. Packed into a steamy hall that smelled of city humidity and baked skin, a cheerful crowd waited for the next cabaret act to take the stage, and outside for a good rainstorm to fall and temper the heat. 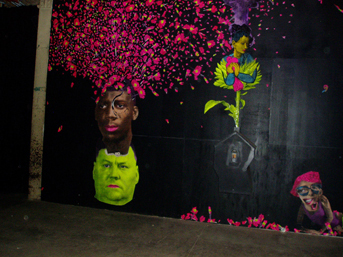 The Saturday night event took place at Starr Space, located at 108 Starr Street, as part of Bushwick Open Studios (BOS 08), a festival organized by Arts In Bushwick. Following dance, burlesque and lascivious trapeze, the hip hop duo Buendia Productions walked out and took a body length’s stance from each other on the stage. Jest Buendia began a fierce flow of rhymes in Spanish and without missing a beat his partner picked up the verbal spar. Everyone was completely absorbed in the art of language and the crowd hollered. Now in its third year, Bushwick Open Studios has created a venue for artists and curators to establish this predominantly industrial, north Brooklyn neighborhood as an atypical arts center. The work is energetic and collaborative, and as organizer Jeffrey Seal reflected during one of the slower moments of the weekend, “if you want to do something, then just do it.” This is essentially how the organization Arts In Bushwick coalesced. A collection of artists, many who had been priced out of the Williamsburg studio market wanted to begin exhibiting their work and created a website and volunteer nonprofit organization. Geographically free from the pretense of the Chelsea art market, art is at play. There is one condition: with freedom comes social responsibility. Laura Braslow, one of the initial members of Arts in Bushwick believes “a major part of our mission is trying to organize artists to be good citizens.” This unofficial mantra is exemplified all around as Arts In Bushwick acts as facilitator between neighborhood centers and artists. The group now has a working relationship with Bushwick Impact, a family service center, and they are in the process of distributing a north Brooklyn survey on civic participation. The idea is to galvanize incoming Bushwick residents to shop locally, instead of hopping on the L train every time they need something. “You can not stop change, but you can have a set of policy and make decisions to deal with rapid development displacement,” says Braslow. On Sunday afternoon BOS sponsored an “Arts, Sustainability and Gentrification Forum”, which met to hash out concrete ideas behind ethical art. While these artists try to manage a responsible immersion into Bushwick, the reality is that the art community sits in front of a wave of approaching commercialism. This could be potentially divisive, except that most of the artists seem willing to confront the paradoxes of market success, and want to find creative methods to maintain the collaborative relationships that have been built. Mike Olin, who helped put together Time Bandits and Portraits of Yoda, a group exhibition at 114 Forrest Street, said that he and several artists began Pioneers of Inspiration around four years ago, which is basically “meetings where we do drawings and we have found lots of similarities between the works”. The show at Forrest Street consists of work by several artists dealing with landscape and pure form, and the intersection of these two spaces to create time and color-scapes, which resonate with a feeling of specific memory place, while also answering formal questions through drawing, painting and sculpture. Both Olin and his studio mate Joy Curtis, who have occupied their space since 2002, said that the development of artist interaction is recent. “It did feel very isolated over here”, Curtis remarked and said that the open studios this year, and Open Spaces, also organized by Arts In Bushwick this past December, brought much more foot traffic through the area. The escalating importance of open studios has been pervasive. All over New York, open studios have increased in scale and promotion. While biennials and art fairs have gained both establishment and financial prominence, open studios have become the artist’s self-inaugurated art fair, in which some artists make a considerable amount of their income. “I have a friend who does open studios in DUMBO and she makes money for almost her whole year from DUMBO sales,” says jewelry designer Jessica Grindstaff. She has done well financially at the open studios and views the success of the Bushwick art scene as being somewhat inevitable: “It will happen soon, people think of these artists as being much more up and coming”. Grindstaff was the first artist to take studio residence in the large corner building on Bogart and Grattan streets. 1 Grattan, which is also aptly and affectionately dubbed “Wonderland,” is now filled with artists who work in an expansive range of mediums. On Saturday afternoon at Wonderland, Lydia Bell choreographed a two-hour movement installation. 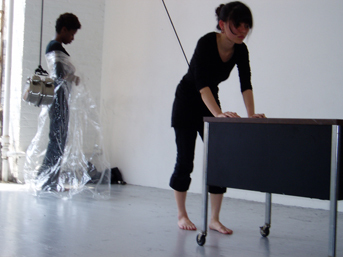 The three-person performance seemed to express the activity of miscommunication. Their engagement both accidental and intentional, the characters moved around the space acknowledging each other, and then receding back into their own activities. A suspended clock at the center was indirectly pushed and pulled. These types of performative open studios seem slightly unorthodox as there is no saleable piece; however this activity lends itself to the spirit of the festival and of the neighborhood itself. There is a constant relationship between sight, sound and a visceral reaction to the work. 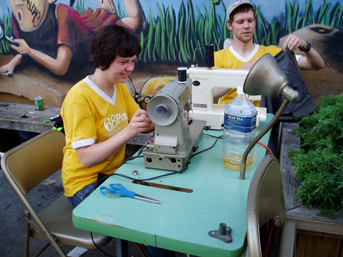 The need for short-term studio space and workshops inspired the creation of several neighborhood art laboratories. Chez Bushwick, an artist-run rehearsal space located at 304 Boerum street, opened in 2002 offering performance space rentals for five dollars an hour. In 2006 Jason Goodman and Jeremy Lovitt opened the prolific doors of 3RD WARD, a facility that offers onsite wood and metal fabrication shops, as well as a digital media lab, which can be rented hourly or daily. And just off the M train to Flushing Avenue is Lumenhouse. This studio opened at 47 Beaver Street in 2007 and was one of the hub locations for BOS 08. The staff hosted screenings for the Brooklyn International Film festival through the weekend, and also offered their 2500sq ft. downstairs studio as the location for an Arts in Bushwick benefit auction. “We thought about doing this for years and years,” said creator and director of the studio space, Aurora Robson. A lumen is a unit of light, and the space acts as a “place in which to illuminate things, ideas, yourself,” Aurora explains while walking around garbage bags filled with discarded, post-consumer beverage bottles that will be transformed by a team of smiling post-grads. The sculptures become large organic interconnected shapes that look like huge seaweed carcasses, or the internal weather of an organic system. They’re wild. The people assembling and organizing the refuse look like a merry hipster cottage industry. “Inside we use human energy instead of fuel energy,” Aurora says of the low tech working process. The initial idea behind Lumenhouse was to build an environmentally sustainable working space that could nevertheless sustain itself economically. To cover the costs of the five resident artists that work there and other expenditures, Lumenhouse also serves as a photography studio that can be rented for a day rate, and offers students discounts. The collaborative nature of this artist space seems relevant in a time when the New York art market is on the precipice of a large shift. “Artists can go straight to the source,” Robson said. “The virtue of the internet has been the ability for self-promotion, and making a localized situation where you can involve your neighbors. It is empowering for artists, and galleries are going to have to change and evolve with us.” Perhaps what makes Bushwick dynamic is that artists and craftspeople step up to produce services as the need arises in a neighborhood where amenities are sparse. Unlike Manhattan’s Lower East Side where you can easily stumble into several art galleries in as many blocks, the Bushwick art scene is still squirreled away in warehouse-turned-studios and lofts above the streets of this industrial neighborhood. Not yet stylish and pricey like Williamsburg, Bushwick still supports a developing young community of artists. The June 6-8 festival, Bushwick Open Studios, coordinated hundreds of artists in the community in an event where any one could share their work. The resulting mixture of exhibitions showcased the great diversity of art and artists within the community, and even within a single apartment building. 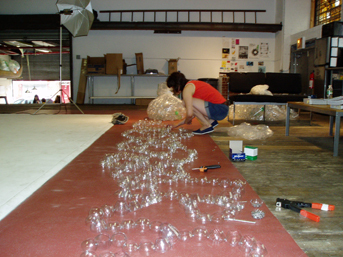 One such studio hub located on Thames Street, known as The Loom, featured a variety of new and established artists. Among them was painter, photographer and digital artist Luc Georges, who displayed a series of photos of the NYC Radical Faeries, a “network of satyrs, sissies, butch leather queens, ceremonial drag queens, queers, pansies, activists, workers, revolutionaries, artists, farmers, witches, pagans, sacred fools, rural and urban dwellers…”. Georges’s photos of these avant-garde artists are dynamic, capturing a vibrant, flavorful festival of wildly colored clothes, bodies, and makeup, and even incorporating vivid graffiti from the city landscape. One of the most striking is a photo of a drag queen dancing solo in “Swan Lake.” The image is a reverse silhouette. Nearly the whole shot is black except for the dancer who seems to glow. Just down the hall, the young artist Max Abeles presented a mixture of sculpture, sound, video and painting. In what he calls “Digital Biomorphism”, Abeles mixes plaster sculptures of bodies and biological forms with computer-made sound. The centerpiece to his exhibition, “040801” (2008), is a phallic, five-foot-tall sculpture that incorporates colored flashing lights. It is a beacon to visitors and cries out with digitally-layered voices of what sound like birds, or maybe a fax machine. Abeles inventively meshes the technological with the organic to create a jarring but imaginative show. The Loom is but one of many clusters of studios in Bushwick. Down the street, Ann Oren’s hypnotizing video installation, “The Factory” (2008), was projected via mirror from the ceiling to the floor where Chinese food boxes delineated the “screen.” The setup allowed audience members to peer down into the happenings at their feet. In the video, small shadowy people appear to emerge from Chinese food boxes and busily carry around small packages, similar in appearance to the text message icon. The people leave the little packages haphazardly on the floor for others to come and remove. The purpose driving these ant-like people is unclear—perhaps they have a mission, or perhaps they are just performing for the sake of their intrigued but confounded audience. On the Arts and Crafts end of the spectrum, book-artist and print-maker Bonnie Kaye Whitfield finds an organic side of art in Bushwick and, like many of the others artists mentioned, shows an acute awareness of locality in her art. Whitfield displayed hand-sewn notebooks and photo albums, bound in a variety of styles. Many were soft-bound in richly colored homemade papers, and others were covered in pages from discarded children’s encyclopedias. Whitfield said that her bookbinding began as a project for her students while she was teaching a fiber arts class and that the interest burgeoned from there as a relaxing meditative craft. Whitfield also displayed paintings, drawings, and solar etchings many of which focus on industrial images in the neighborhood such as torn chain link fence and barbed wire on signposts. Her etching, “Flushing Ave. I” (2007), done on paper recycled from garbage found outside her door, highlights Whitfield’s attentiveness to her environment. The art community in Bushwick may be hard for outsiders to locate at first, but it is incredibly supportive and fertile. The network is there, and perhaps because of its communal nature, Bushwick’s own, unique brand of art is emerging. Luc Georges will be showing some of his images at the Spread Gallery in Bushwick beginning June 27th. He will also put on a larger show called “Fresh Fruit” beginning July 15th at the Leslie/Lohman gallery in Soho. More of David Rhoden’s images can be viewed online at www.davidrhoden.com. View more of Bonnie Kaye Whitfield’s etchings at www.bkaye.net. Kristen Hewitt. Kristen is from Chicago, is one year away from getting a bachelors degree in English/creative writing at Bates College in Maine, and is living in New York for the summer. She loves traveling and attempting to learn languages and reading lots and hiking and playing the fiddle. And grapefruit.